First of all thanks a lot for all the great work you have done on MultiWii. It is really a great piece of software that is well though through. It is pity to see all the other flight controllers that bring no significant difference. And people do go for it. So I got hooked up. I have had initial conversations with some people in here already and there seem to be an interest in creating a driver for MW for SoC boards (like Raspberry Pi, RPi Zero, Odroid, BeagleBlack, etc). This way we can extend MultiWii functionality. Obviously this requires the multirotor to carry 2 boards - MW & SoC. So here it is - all done. This project aims to simplify and extend the functionality of MultiWii by providing set of packages such as mw-mavlink (that makes MultiWii mavlink capable so you can use i.e. QGroundControl), mw-ws (that allows user to monitor and control MultiWii through a web-browser), mw-ps3 (to fly MultiWii using a PS3 controller), mw-cli (to control it from a command line), or mw-config (to configure, compile and flash MultiWii without the use of any additional programmers). Last edited by gregd72002 on Fri Apr 15, 2016 8:50 pm, edited 11 times in total. I will be adding some live charting for attitude the next days so stay tuned. Do you have a video e.g. on YouTube that gives an overview of the www software in action? Can you integrate an ESP8266 wifi module with this software? I would rather say this software is an alternative to ESP8266 if you really want to compare them. To use ESP8266 you will most likely need to alter MW code (correct me if I am wrong). This software (mw-service in particular) is a service that runs on any *nix capable board (like RPi, Beagleboard, ec) . It integrates with MultiWii over UART (uses MSP) and provides a communication API. On top of it you can install mw-www which further extends the functionality by exposing WebSocket interface so you can connect to it and issue commands to MultiWii via a web browser. At the moment we are also considering creating a mw-mavlink service to allow integration with ie. qgroundcontrol. i am stuck for i cannot run ./autogen.sh on the mw-www aspect. The mw-www consist of 2 parts - proxy and actual html code (www). Just run ./autogen.sh, make, make install inside the proxy folder. Thanks! that actually helped perfectly, I used the www from mw-config rather than mw-service, it worked far better in the apache server. the www on mw-service didn't work for me. I even initiate ./mw to see the outputs the ps3 controller is giving out, and it changes and works, (had to change the joystick from js0 to js1 on the ps3.c file line "ret=rec_open("/dev/input/js0",&js);"
It all seems to work but my motors never turn on, how do i arm the motors to start flying. p.s. i was unable to install mw-mavlink. I ran ./autogen.sh successfully but am not able to sudo make or sudo make install the file, Error 1 is products telling me mw_mavlink-mw.o failed when i try to sudo make. Do i need mw-mavlink to make this work? I still can't get the ps3 controller to turn the motors on though, its as if the program is not communicating with the ps3, because it is definitely connected and communicating with the raspberry pi. how can i make this a known command ? can i program the square and circle keys too ? It looks like you are on top of it. The unknown command message is fine, not all buttons are mapped and pressing them will result in the message. Seeing the x or circle changing box value means the PS3 controller is connected correctly. When you use the PS3 controller analogue sticks should work and you should see the RC value changing (you do not need to be armed to see changes on the RC section). gregd72002 wrote: It looks like you are on top of it. The unknown command message is fine, not all buttons are mapped and pressing them will result in the message. Seeing the x or circle changing box value means the PS3 controller is connected correctly. 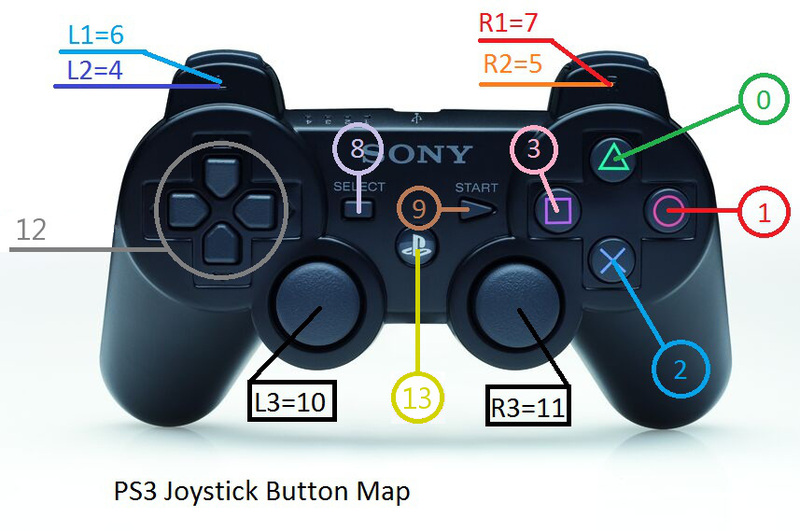 When you use the PS3 controller analogue sticks should work and you should see the RC value changing (you do not need to be armed to see changes on the RC section). I am not seeing the values change through rc tab, what can I do about that? Bare with me for a few days. I'll need to look into it later this week. From what you say it sounds like the PS3 controller you are using is different to the one I've got and tested with. It will be trivial to get this to work I just need to update the program so it reports the details of the controller you've got there and we can take it from there. i see it is still under heavy development, well i believe the reason i could not get it to run well its because i was unable to install sixad because there is no support for it on jessie image of raspberry pi. I also was using the latest raspberry pi 3 with wifi and bluetooth build on it. Which image of raspberry pi are you using if you don't mind me asking? i am about to do it all over again on Wheezy image now. hey sorry but i am doing this all over again, when you told me to install inside the proxy server, i have no idea where the proxy server location is, could you please point it out ? i know the web folder for the apache2 server is in /var/html/. Thank you ! Hi, I'm back after holidays so should be able to assist more now. Sorry for all the delays. As far as I understand you've got RPi and an Arduino (or similar board). Based on the screenshots it looks like you had the mw-service installed correct as well as the mw-www and mw-config. You have also flashed the arduino with the correct code. The WWW pages should be copied to your apache folder. You have done it correctly as otherwise nothing would work. Also, lets forget about mw-mavlink for the time being and try to get the mw-ps3 to work if this makes sense? If you encounter any problems at any stage I will need to see the entire outcome rather than the last error message. You could paste it in here or pastebin.com if needed. So the missing bit was mw-ps3 that it was not reporting your joystick movements. I suggest to plug the joystick via USB at the beginning to test things so there is no need to install anything in additional like sixpair, etc. All joystick movements (L3 and R3) should be reflected in the RC section on the www. Let me know how far you get to and we will take it from there. gregd72002 wrote: Hi, I'm back after holidays so should be able to assist more now. Sorry for all the delays. can i use tiny proxy on rasping jessie and host the proxy folder in there? ps Im a total newbie you can explain in detail if you can lol, this is really my first raspberry pi project! you do not need dedicated proxy server. The mw-www comes with its own proxy (see mw-www/proxy folder). You just need to compile it and install, that's all. based on your pictures you had it running before. the mw-www/www uses than this proxy to communicate with mw-service. This has been the best post I have found in dealing with a Rasppi and multiwii board. Thank you for your development. I've installed everything here and it all works with the mw service and all web config parameters. I can't seem to make qgroundcontroller to work. I'm running it on OSX, it says it connects over UDP, gives me no feedback though and doesn't seem to read anything off the board. My GPS is working, can arm the motors with a TX.